So today my task at the library where I am employed as the nominal “systems” librarian (a very part time job mostly concerned with the eventual automation of the card catalog) was to decipher the procedure for using WebJunction’s TechAtlas (Â© Powered by OCLC) to do an inventory of our four public access computers. This inventory is mandatory for those applying for funds from the Bill and Melinda Gates Foundation. Here is how my day went. Our library had gotten a letter from our state librarian including a letter from the TechAtlas people explaining the steps we needed to take to do this. The first step which was strongly suggested but not required was to sign up for a webinar that explained, I suppose, how to do the inventory. My boss wanted to arrange a time where she and I could both be present for the webinar. I got as far as the Wimba set-up asking me to disable my pop-up blocker (do not get me started on the 2.2 MB door card again) and then said I thought we could figure out the process (for our FOUR computers) without it. So, on to the mandatory inventory. This was the first thing that greeted me, a browser incompatibility message (some language nsfw there). What this means, in a more polite fashion is that TechAtlas has some nifty IE tools that can make the inventory process a lot simpler. Firefox users need to do more of the process by hand. You know, that’s fine with me. I don’t like it, but that’s okay. However, acting like this isn’t a series of choices that were made by designers and program managers seems somehow odd. Odder still, when I went home this evening to grab some screenshots, the site now gives me a similar “Browser Incompatibility” message and yet displays that I am using a compatible browser. Apparently Firefox got compatible within the last few hours. I guess this is good news? 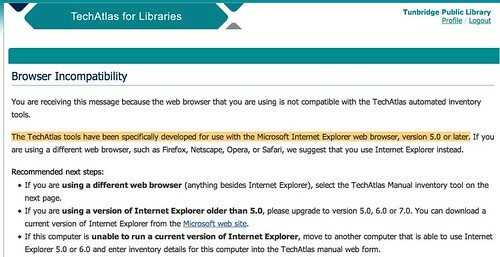 The part they left out is that my browser is incompatible because I’m on a Mac, not because I’m using Firefox. So we have four computers and it’s not that difficult to fill in the blanks. For each computer, there are twenty-two fields to fill out, but only five of them are mandatory. We have four identical computers so this was actually pretty simple and you can edit the entries if you get anything wrong. Oddly, one of the questions: “Opportunity Online Grant Funds?” which is asking whether you used this certain grant to get the money to buy the computers originally (a question our librarian wasn’t totally sure about, but was pretty sure) isn’t actually editable after the fact. I hope I chose correctly! So, it didn’t take terribly long. Most of my time at work today was spent cursing at Overdrive and having to do Windows Media Player updates on computers that are locked down via Centurion guard. What I told the librarian — who is a very nice lady, and sympathetic to my muttering in a “There but for the grace of god go I” sort of way — is that this time around, if they let us, maybe we should get Macs. I’m the project coordinator for TechAtlas. As I would say to any user, I’m sorry if the process wasn’t as smooth as it could have been. Our goal is certainly to make the process as straightforward and easy as possible. However, using the feedback you wrote, we can improve the process for other users and I think you have already seen some of those changes take effect. The Firefox issue that you found is something that our developers have worked on improving. We can now allow Windows users with Firefox browser to use the automated inventory tools. However, for several reasons, I was waiting on updating those workflows until January. In light of your comments, I did change the page to inform users that Firefox will work with the automated tools. I will also update the message to clarify for non-Windows users. Sometimes we can fix issues with the system quickly, as long as we know there’s a problem. We value user feedback and suggestions and a great deal of the improvements that are made to TechAtlas are driven by user requests. If you see anything in the future, feel free to send us a message (techatlas@webjunction.org) so we can quickly resolve any issues and continue improving the resources. In some instances it is better, although not as macho, to RTFM or in this case invest an hour in the webinar. If so you would have learned that there are only two tasks necessary to comply with this section of the grant application process. First update the library information. Change the contact name, you can always use the blind account like “comments” and your usual password, add perhaps the director as the secondary contact, use the NCES lookup tool provided or or Google NCES (took me 1 minute to get the NCES for Rutland) and save. Estimated time to complete 2 minutes. Log off TechAtlas and log back with new login information. For four computers, depending on how much info you need you can use either of two tools. The local tool, designed for standalone computers or work group computers can be run from a thumb drive or even a floppy and the results can be saved to be uploaded later. If the computers are identical, let’s say 4 Gates grant computers. Upload the first one, chose view/edit, chose “duplicate” and copy it four times. Open copy1 and rename, rinse and repeat. Let’s save you ran the tool on all four computers…estimated time to complete 8 minutes (10 minutes if you count travel time between desks). If it were me, and I had four pretty similar computers I would chose the manual inventory, fill in the name of the computer, the OS,check whether or not it is a public access computer,add the date purchased and submit. Than I’d copy this 3 times, rename the copies and be done. Bottom line no more than 30 minutes work may get your library enough cash to buy 8 new Macbooks. Frankly not a bad investment despite the aggravation. As to Overdrive I feel your pain and have about 100 computers to update…but the good news is that Overdrive now works with iPods so I guess that there is a silver lining. You’re totally right, logging in to the website and figuring out how to make my profile information stick was the most frustrating part of this whole enterprise. I got all the relevant infomation about the necessary tasks from the letter. Once I logged in, it was simple to plug in the information — which I didn’t need to watch a webinar to figure out. I work roughly five to eight hours a week, an hour-long webinar is not cost effective for me or my library especially if it’s explaining to me how to do 30 minutes worth of work. The webinar would not have saved me two calls to NELINET (for my login and to figure out why there is another library’s name pre-populating the “network” area) and it would not have saved me from stepping through the “browser incompatibility” page. I appreciate what the Gates Foundation has done for libraries in Vermont and outside of Vermont, but I feel that in 2008 there’s very little excuse for bad user interface design and mandatory websites that appear to still be in beta. Many librarians where I am aren’t much more advanced than their patrons technologically and this sort of thing has a chilling effect on their ability to get finding and advance in their tech knowledge and skillset. As someone who has nothing to do with any of this, I’d just like to point out that many of us have had many bad experiences with Webinars and would just like a damn page with what we need to do in plain writing. I don’t understand why everything has to be done in Webinar format that requires an hour to watch plus finagling your computer… which if you’re lucky, you have the access to do. (Try being the member of a 40+ library consortium sometime. You don’t have that luxury most of the time.) And if I have one more Webinar that requires me to sit on the phone for an hour at my computer, which requires me not only finding the time to watch the Webinar but ALSO scheduling the office phone so no one else is using it, I’m going to scream. So I’m sort of with Jessamyn when she scrapped the Webinar pretty quickly. I have this TechAtlas fun to look forward to. I’m signed up for the Webinar though I don’t really look forward to it. Sometimes I wonder why we have to jump through so many hoops to get some money for library computers. If we’re eligible in their eyes why don’t they just send us a check and have us report back to them on what we got for the money. As I understand it, the money will be divided into two years, with the first year requiring a 25% match & second year a 50% match. Last time around we had to get the computers they told us to (expensive ones) that haven’t stood up any better than the cheaper ones we have. I wonder if it will be the same this time. I can buy the four computers we need for what the matching funds will be for this grant. We already own four licenses for the Centurion Guard software & can use those. I also got four licenses for Office 2007 from Tech Soup for $20 ea. so already have that. I keep asking myself why I’m even considering putting myself through the process. Just in case, I guess, and on the hope that this time around we’ll have a little more leeway in computer choice. is incompatible with operating systems that are not the very latest. very latest operating system but doesn’t work with other operating systems! I am Steve Sanzo from NELINET. We are working with the Vermont State Library to help coordinate the Gates Grant. Just chiming in to answer Linda’s question…yes, you will be able to purchase any computer system you would like. All of you will soon be receiving more details – but first and foremost, to remain eligible, get your inventories completed and then the process will becoming clearer.